LANSING — Some are raising money from anonymous donors. Others are being powered by six-figure contributions. Regardless, groups operating outside of the candidates’ campaigns have already had a $9-million impact on Michigan’s 2018 race for governor. And there are still 12 days to go until the Aug. 7 primary election. A combination of political action committees, super PACs and nonprofit organizations that want to sway Michiganders' votes for governor has spent at least $8.9 million. The Michigan Campaign Finance Network arrived at that figure by analyzing disclosures from groups that fall under reporting requirements, broadcast TV ad-tracking data from Kantar Media/CMAG and other ad-purchase disclosures made to the Federal Communications Commission. It’s likely that by the time the primary election is over, spending by outside groups to influence the gubernatorial race will surpass $10 million. That would be more than double what MCFN tracked from outside groups in the 2010 primary races, the last time Michigan saw competitive campaigns in both gubernatorial primaries. But the 2010 race didn’t see the candidate-focused super PACs that are driving up spending in the 2018 race. These super PACs can raise unlimited amounts of money from corporations or labor unions to support candidates. They are supposed to operate independently of the candidates’ campaigns. 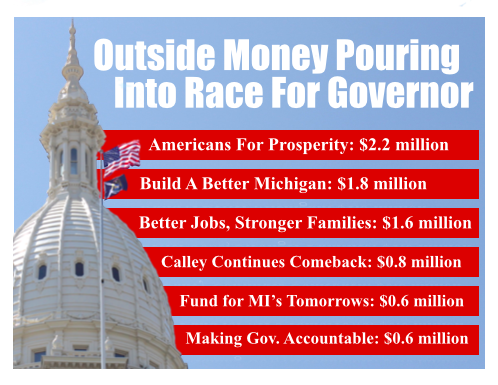 Better Jobs, Stronger Families is the Super PAC backing Republican Attorney General Bill Schuette while Calley Continues Comeback is supporting Republican Lt. Gov. Brian Calley. Better Jobs, Stronger Families had reported raising $2.4 million as of July 26. It’s reported spending $1.6 million. Like other groups, it’s spent heavily on TV and digital advertisements. The super PAC’s top contributors include two nonprofit social welfare organizations that don’t disclose their donors. The Fund for Michigan’s Tomorrows, which is also airing TV ads to support Schuette, has given $300,000 to the Super PAC. Better Jobs, Stronger Families Policy Solutions, which was formed the same day as the Super PAC, has given $275,000. The Fund for Michigan’s Tomorrows has aired about $628,000 in its own ads promoting Schuette. Better Jobs, Stronger Families has also received $250,000 contributions from Oakland Financial Corporation (a business connected to the Moroun family), Peter Karmanos of MadDog Technology and Mohammad Qazi of Ciena Healthcare. In addition, Schuette has benefited from a $30,000 digital ad buy from the Michigan Chamber of Commerce’s Super PAC. Calley Continues Comeback has raised $948,560 and spent $861,867. Its top donors include Northwood Group’s William Parfet, who’s given $323,540, Kelly Services’ T.E. Adderley, who’s given $250,000 and DP Fox Ventures’ Dan DeVos, who’s given $200,000. A handful of other groups have also been buying airtime to back Calley for governor. Two of them disclose their donors. Two of them don’t. MIPAC, a PAC connected to Calley, has reported $242,300 in independent expenditures to support Calley. The Relentless Positive Action PAC, a PAC connected to Gov. 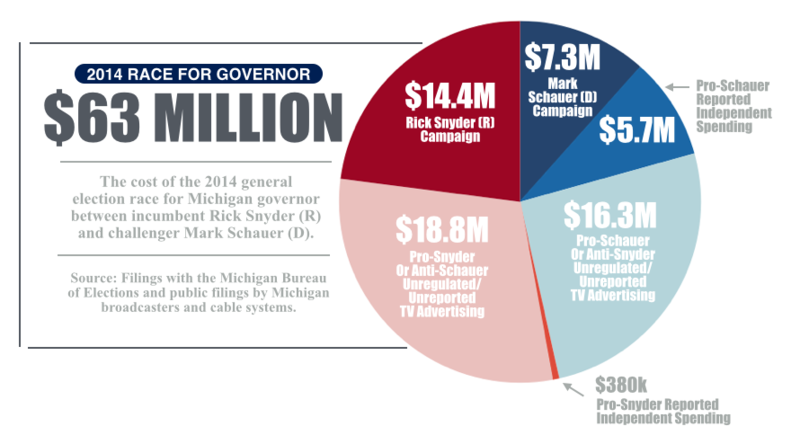 Rick Snyder, has aired an estimated $343,000 in broadcast ads promoting Calley. Snyder is supporting Calley in the race for governor. MIPAC’s top donor this year has been Dan DeVos, who’s given $300,000. The Relentless Positive Action PAC’s top donor has been Roger Penske of the Penske Corporation, who’s given $250,00. Making Government Accountable, a nonprofit that’s also connected to Snyder, has aired at least $664,708 in broadcast and cable advertisements touting Calley. The Fund for Michigan Jobs has aired an estimated $389,000 in broadcast TV ads promoting Calley. Both of those groups are so-called “social welfare” organizations that don’t disclose where their money comes from. On the Democratic side of things, the most active outside group has been Build A Better Michigan, a 527 organization that’s been working to promote former Senate Minority Leader Gretchen Whitmer, a Democrat from East Lansing. The group has been running ads that it believes are issue ads, meaning they don’t fall under Michigan’s campaign finance reporting laws and they don’t expressly tell people how to vote in the election. However, the ads have already drawn a campaign finance complaint from Republicans because the ads specifically describe Whitmer as a candidate for governor while talking positively about her. Build A Better Michigan has raised $2.2 million and spent $1.8 million. Its top donors include two Democratic Party organizations that don’t have to disclose the sources of their dollars: Progressive Advocacy Trust, an Ingham County Democratic Party Administrative Account, which gave $300,000; and the Philip A. Hart Democratic Club, which gave $250,000. The United Auto Workers and Emily’s List have each also contributed $250,000. While Whitmer has gotten help from Build A Better Michigan, the national conservative organization Americans for Prosperity has been working against her. Americans for Prosperity has reported $2.2 million in independent expenditures on mailers and TV ads against Whitmer. The group, which is connected to the Koch brothers, doesn’t disclose the source of its dollars. The public will know more about the money in the race for governor on Friday when the candidates will file their own new fundraising disclosures covering from Jan. 1, 2017, through July 22, 2017.